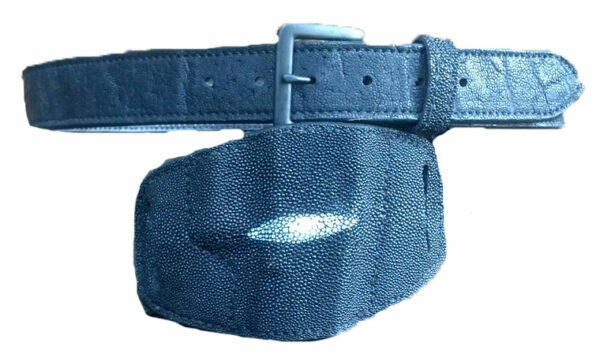 The Premium Stingray Gun Belt is made from premium stingray leather. 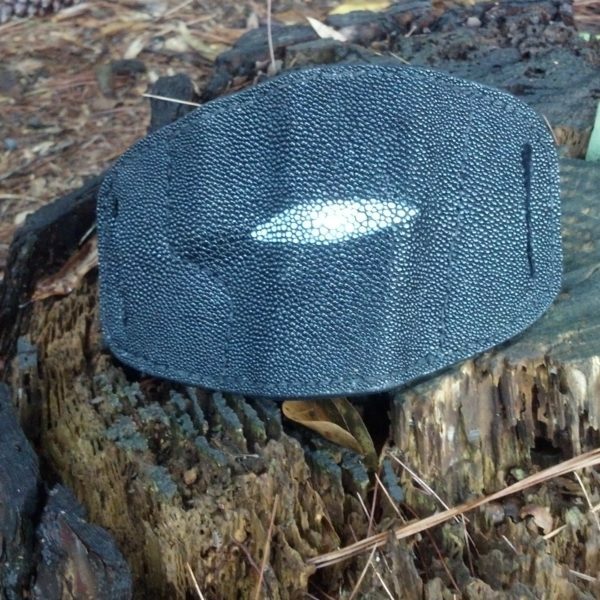 When constructing the gun belt, MTR uses 1 piece of grade A medium ounce leather and one peice of grade A stingray leather. 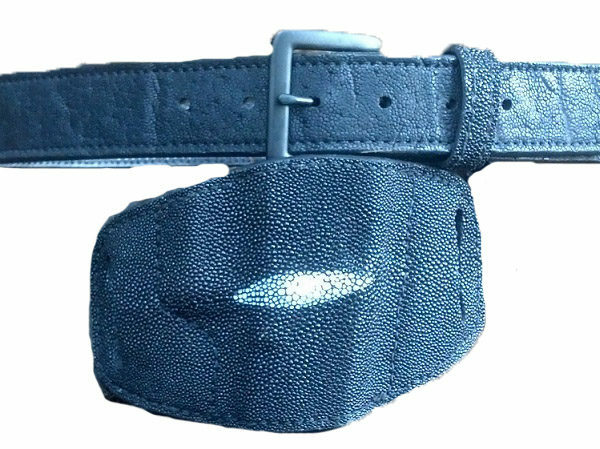 By using two pieces of leather instead of one helps to decrease the short term of the belt rolling over in the back, stretching at the holes and wearing out fast. Using two pieces of leather aids in the function of drawing your weapon fast. 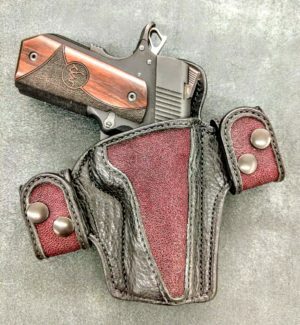 Your holster will stay nice and tight onto the belt and not raise up when drawing the weapon from a holster. By having a stiff belt that secures your holster tightly will increase your concealment of the weapon. MTR Custom Leather gun belts are ¼” thick. Which is thickness a gun belt should be when carrying. MTR uses a professional slicking technique that brings the two pieces of leather into one on the edge. 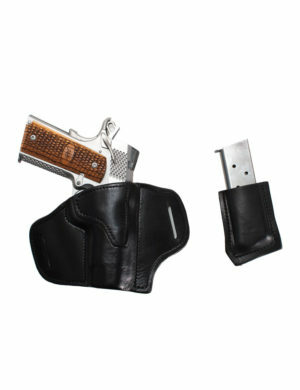 This helps to slide the holster and accessories onto the belt easier. Also, with the professional slick edges on the gun belt helps for long term of the edges not splitting. MTR Custom Leather uses heavy duty nylon thread instead of cotton thread. Nylon thread is a lot more durable and stronger. The belt buckle is held together by 2 Chicago screws. Convenient and efficient way to carry multi- barrel lengths. For example, 1911 pancake holster will accommodate all 1911s 3″,4″,5″ & 6″. 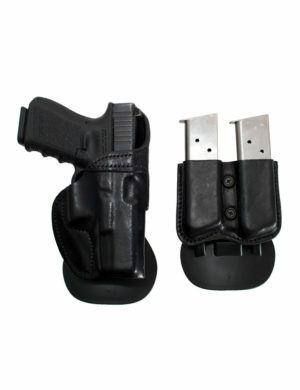 Glock pancake holster will accommodate models 19,23,32,26,27,17,22, 34, 25, 38, 33, 39, 18 & 31. Each holster is molded to the actual frame to cover the trigger of the weapon, leaving the barrel/muzzle open.